• Hurricane Irma’s projected path shifted west overnight Friday, lining up the coast of southwestern Florida for an extremely dangerous direct hit on Sunday. When it reaches the state, Irma will probably have re-strengthened into a Category 4 hurricane, packing destructive 140 mph winds and pushing a projected storm surge of up to 15 feet in some areas. A storm surge of that magnitude could devastate the flood-vulnerable coast, including the cities of Naples, Fort Myers, and Tampa. Some 3 million people live in the area that is expected to fall within Irma’s path. • Irma is expected to strike the Florida Keys at around 8:00 a.m. Sunday morning and hit the southwest Florida coast on Sunday afternoon. It regained Category 5 strength before making landfall in Cuba Friday night, but weakened while churning along the country’s northern coast. Florida can expect to start experiencing more intense effects from the storm late Saturday. • “Evacuate,” Florida governor Rick Scott warned residents on Saturday morning. “Not tonight, not in an hour. You need to go right now.” Scott also warned that first responders would not be able to rescue anyone once the storm started. More than 6 million people in Florida have been told to evacuate their homes and either get out of the storm’s path or take refuge in one of the hundreds of shelters that continue to open across the state. The evacuation is mandatory, but that doesn’t mean people can be forced to leave. Including Georgia residents, nearly 7 million people have been told to evacuate as Irma approaches. 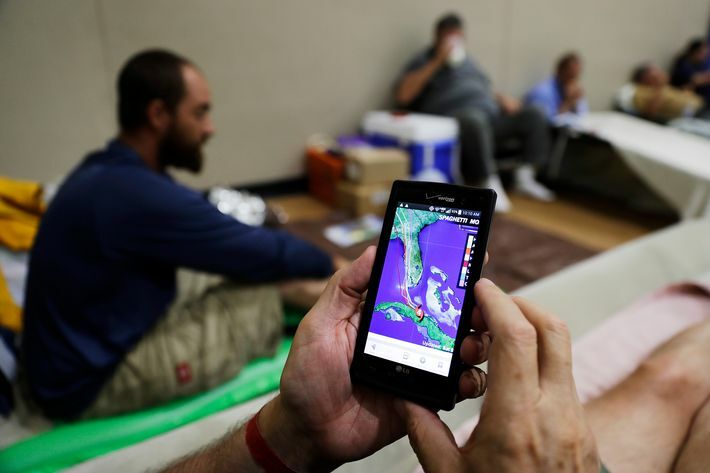 • At least 50,000 people are staying in hundreds of Florida shelters to weather the storm. More shelters opened in the state on Saturday after the storm’s path changed. • If the models are accurate, Miami and southeast Florida will escape the core of the storm, but the region will still experience storm surge and life-threatening winds. Irma, which has already killed at least 25 people and caused catastrophic damage along its path through the Caribbean, weakened to a Category 3 storm on Saturday morning, with winds of 125-to-130 mph, as it traced Cuba’s northern coastline. But Irma is expected to regain strength late Saturday once it moves back over warm water on its way north. When Irma made landfall in Cuba on Friday night, it was a Category 5 storm with 160 mph winds — the first Category 5 to strike the country since 1924. The outer bands of Irma began bringing tropical-storm-like conditions to Florida’s southern coast on Saturday. Irma is expected to make landfall in the state on Sunday morning, with conditions beginning to worsen late Saturday night. According to the latest weather models, the storm is now expected to strike the state’s southwest coastline, with the potential for direct hits on Naples, Fort Myers, Cape Coral, and Tampa on Sunday afternoon and evening as the storm moves north-northwest along the Gulf Coast. Miami and southeast Florida, where extensive evacuations have been ongoing for days, look like they will be spared from Irma’s destructive center and most extreme storm surge, but they are not out of danger. The powerful storm, which may return to Category 4 strength, will bring dangerous and destructive winds, including gusts as high as 150 mph. Florida’s southwest coast is expected to experience a catastrophic, life-threatening storm surge of up to 15 feet, which will mean a lot of coastal areas may experience catastrophic flooding. Inland flooding from rainfall is also possible. The Florida Keys are still directly in the storm’s path and may get the brunt of the storm on Sunday morning when Irma’s eye passes between Key West and Marathon. It’s possible that Irma will be the worst storm to ever hit the Keys. Some parts of Florida’s flood-vulnerable southwest coast are projected to receive 10-to-15 feet of storm surge above ground level. That danger is something weather experts and Florida authorities were working hard to communicate on Saturday, since so many people live in communities along the coast, and many of those communities, in cities like Naples, Cape Coral, and Fort Myers, include neighborhoods that would be completely flooded, if not destroyed, by such a high level of water. “Do not think the storm is over when the wind slows down — the storm surge will rush in and it could kill you,” Governor Scott warned Florida residents who did not plan to evacuate. 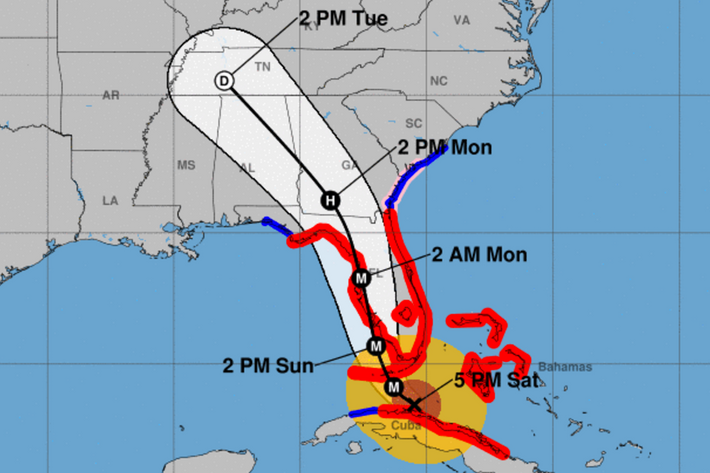 Though the projected path of the storm has changed and many Floridians have already evacuated from the southern part of the state, the National Weather Service warned on Saturday that much of Florida and the southeast will still experience life-threatening winds regardless of which way the storm ultimately moves, meaning that people who have already evacuated areas that were originally in the projected path of the storm should not return to their homes. In addition, the storm could still shift east or west as it travels north, and inland flooding is also expected from the as-much-as 25 inches of rainfall that some areas of Florida and Georgia could receive from Irma over the next few days. Mass power outages are also expected, with the Florida Power and Light Company estimating that as many as 4 million customers could be affected. The mass evacuation underway in Florida and Georgia is unprecedented, comprising millions of affected residents, and the effort has been ongoing for days. Officials in both states, as well as in Alabama, are working to keep evacuation routes open and moving. On some highways, like Interstate 4 out of the Tampa area, officials are letting people drive on the shoulder to allow cars to travel more quickly. In Georgia, one-way traffic was allowed on highways to cope with the flow of evacuees. Evening curfews have also been ordered by authorities in many areas to encourage residents to feel safe about leaving their homes and belongings behind. Those that chose not to drive away from the storm, or couldn’t, have been filling shelters throughout the region. 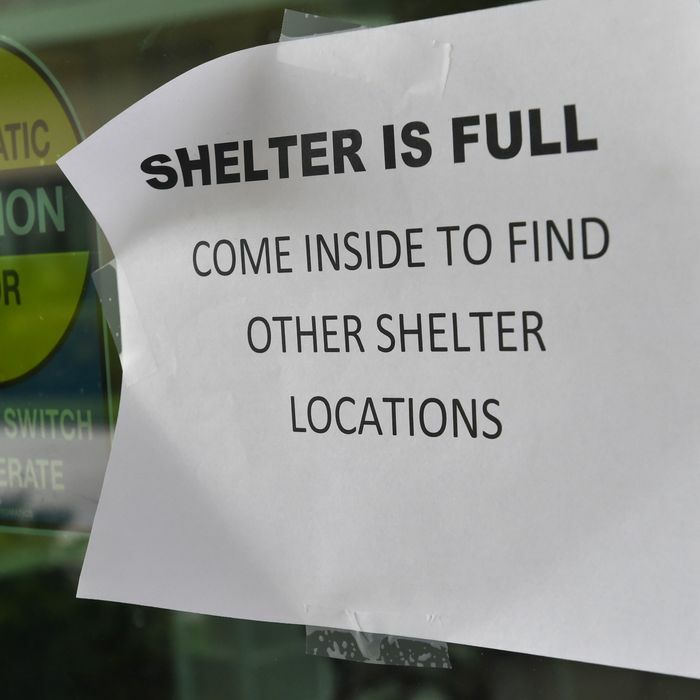 Florida officials said on Saturday that new shelters were opening as other shelters filled to capacity, with more and more people trying to get away from the danger.